The first 10-card series of 14,000 Phillies Originals is now complete. I’ve tweaked the design a little on the back to include a couple new school stats that you won’t find on the back of any Topps cards. 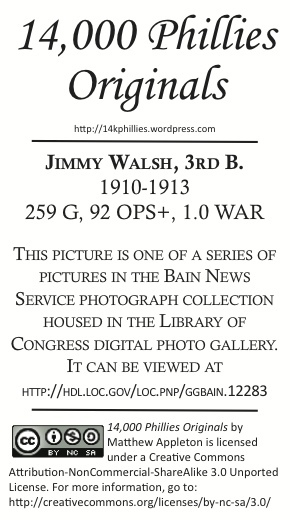 Furthermore, to the best of my knowledge five of the players — including Jimmy Walsh, shown here — have never appeared on a Phillies card before. As I stated in my post announcing this set, if you are interested in this set, you can either print them yourself on Avery 27871 business card stock, or you can request that I mail you a set that I print myself. If you want me to print them for you, I would appreciate (but do not require) something in trade — I will provide a want list to those who ask me to mail the set. Either way, send an email to “mattapp” at the email service run by Google, and I will either email a PDF or send you a printed set upon your request. 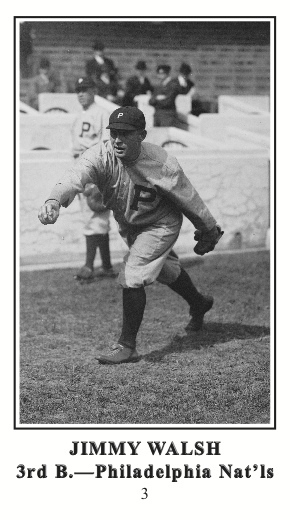 I am also willing to create cards for collectors of other teams, with the same request — please offer something in trade — that I’ve made to those who request printed 14,000 Phillies Originals. The second series will be ready before the end of the month. To the best of my knowledge, all the photos used in this series are in the public domain and have no rights issues. However, these are unlicensed and meant to be treated no differently than Broder cards from the 1980s. I ask that no one attempts to sell these cards for profit — in fact, the Creative Commons copyright on the back makes it clear that this issue are not to be used for commercial purposes. I admittedly used the M101-4 design due to the ease with which I could recreate it, but I do plan to use other relatively easily reproduced vintage designs — such as the 1927 American Caramel Series of 60 (E126) or 1979 Diamond Greats — for future series.